What Is Black Spot Algae? Black Spot algae is quite possibly the worst type of “infection” that can affect your swimming pool. Not only is Black Spot algae unsightly and grossly unhygienic, it can also be incredibly expensive to treat with some cases requiring a complete resurface of the swimming pool. Of all the types of algae and species that can invade your swimming pool, Black Spot algae is the most difficult to treat because of its resilience to everyday pool cleaning products and its tendency to further breed and flourish. It has very deep roots that can grow into the sides of plaster, in between tiles and pool pebblecrete. The algae’s hardiness makes it difficult for even chlorine to penetrate and kill. The first step in removing Black Spot algae is brushing the algae from the lining of the pool. In order for any chemical breakdown of the algae to occur, the membrane and various levels of the algae need to be brushed away from the surface. The strength and durability of the algae requires some heavy handed brushing with a steel bristle brush or stiff plastic bristled brush. Get yourself some goggles and get in the pool to ensure every piece of the stubborn algae is removed. 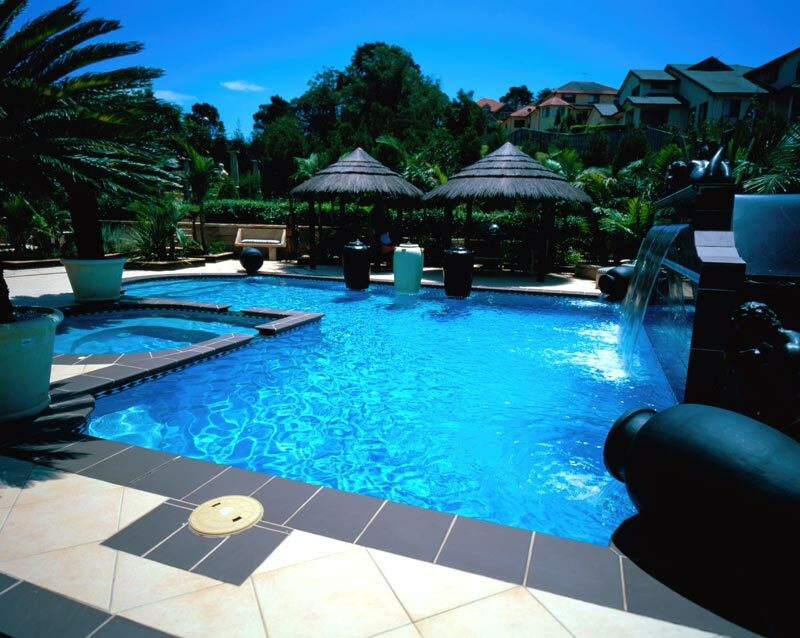 After brushing, vacuum the pool to prevent black algae spores from reattaching to the pools floor and walls. Once the pool’s floors and walls have been completely scrubbed down and vacuumed it’s time to shock the pool. Triple shock that is. Because of its aggressive nature Black Spot algae needs an aggressive approach to stop it in its tracks. Add 1.5kg of chlorine for every 40,000 litres of water. Leave the filter off to enable the chemicals to attack the Black Spot. After 24 hours brush the pool again three to four times paying particular attention to the areas that you first noticed the Black Spot as the deep roots may still be embedded in the walls, grout and tiles. Vacuum again and then run the filter for 24 hours. After you will need to clean your filter by manually washing the cartridge and backwashing the sand filter to remove any spores that may infiltrate your pool once more. When it comes to Black Spot algae prevention is definitely better than cure so ensure the swimming pool’s total alkalinity levels are between 80 and 120 ppm (parts per million) and pH levels are between 7.4 and 7.6 at all times is a good start. Pools with traces of algae may require higher alkalinity levels of between 120 and 150 ppm to ensure a healthy swimming environment.